When it’s meal time on the Gulf Coast, seafood usually takes center stage. Over the years, the area has become famous for its high-quality shrimp, crab, oysters and fish. But, folks who delight in delicious food will discover that the Gulf Coast has much to offer beyond seafood. From fantastic barbecue to mouth-watering burgers to decadent homemade cheesecake, you’ll find a wide variety of savory meals in the cafes, restaurants, and burger joints in and around Gulf Shores and Orange Beach. 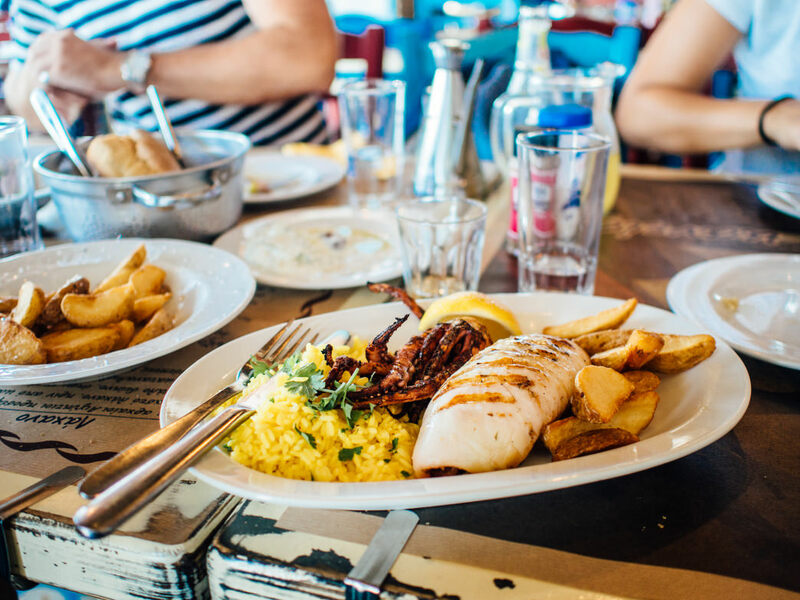 When you’re scouting spots for breakfast, lunch, or dinner, consider the following places that are especially popular with Gulf Coast locals. For locally brewed coffee, and some of the best breakfast dishes in town, head to Buzzcatz Coffee @ Sweets on Canal Road in Orange Beach. A favorite is their take on Challah, a braided Jewish bread. To add some oomph, Buzzcatz packs its homemade Challah with scrambled eggs, cheddar cheese, and your choice of locally grown vegetables, bacon, or that Southern favorite—Conecuh sausage. They also bake fresh cinnamon rolls, quiche and cathead biscuits, which are named for their size—they’re about as big as a cat’s head. The aptly named Hazel’s Nook, at the intersection of State Highway 59 and State Highway 180, is small, but its cooks pack a lot of flavor into a homemade breakfast. Locals will tell you that the Nook’s biscuits and sausage gravy are out of this world. In fact, the restaurant has served the "official biscuit of Alabama" for decades. Plus, the breakfast buffet includes an amazing array of choices, including a top-notch omelet station. If you’re looking for good Southern barbecue, saunter into Hog Wild Beach and BBQ on State Highway 59, just south of Waterville USA. To flavor its chicken, pork, and ribs, Hog Wild applies a special dry rub by hand, and then cooks the meat slowly over Southern pecan wood for a long, long time. Then, Hog Wild serves its meats with homemade sauces, like the Surfin’ Whiskey, Nana’s Sweet Q, or a special White Sauce. If you’re adventurous, try digging into the monster Nasty G, which combines chopped rib meat, chicken, and pork topped with three BBQ buffalo shrimp, white BBQ sauce, and Hog Wild’s "Not-Your-Traditional" coleslaw. If you’re a burger fanatic, you don’t want to miss Bahama Bob’s Beachside Café on Beach Boulevard (State Highway 182). While Bob’s is best known for its seafood, the cafe also serves the amazing, 10-ounce Bahama Bob Burger, which is prepared island style, with Swiss cheese, bacon, and grilled pineapple. If you’re just hankerin’ for a good sandwich, swing by the Flip Flop Deli Shop across the highway from Bahama Bob’s in Gulf Shores. Sitting on the side of the highway, the deli looks like a small beach house, but don’t let that fool you. Flip Flop’s sandwiches are delicious! Try the Roll Tide Wrap, which includes turkey and provolone in a wheat wrap that’s served up with lettuce, tomato, and a pickle, plus a choice of sauces. Or, try the unique West Beach Walking Taco—a bag of crushed Dorito chips with taco meat, shredded cheese, salsa, and sour cream. We can’t forget dessert, now can we? Since 1996, Hope’s Cheesecake on State Highway 59 in Gulf Shores has offered the most delicious, smooth, and creamy homemade cheesecakes anywhere. While Hope’s specializes in standard cheesecake, it also creates cheesecakes with remarkable flavors like blueberry, chocolate, and Reese’s Peanut Butter Cup. After a hot day on the beach in Gulf Shores, head down State Highway 182 to Island Ice Cream, where you can choose from a whopping 40 flavors. Sure, Island offers chocolate, vanilla, and strawberry, but how about Cappuccino Crunch or Caramel Cheesecake Cookie Monster? If you’re daring, try Muddy Sneakers, a combination of chocolate caramel peanut candies, milk chocolate flakes, and white chocolate ice cream, topped with caramel fudge ripple. It seems like a crime to visit Alabama’s Gulf Coast without sampling the seafood. Ask locals, and they’ll tell you the top seafood spot is the Original Oyster House on State Highway 59 in Gulf Shores. When you visit, start with a delectable appetizer, like Joe and Dave’s Fried Alligator Bites (yes, fried gator) or fried crawfish tails. Then, dig into crunchy deep-fried fish and grits, shrimp, or soft-shell crab. Of course, we can’t forget the oysters. While you can order a standard platter on the half shell, you can also get oysters that are topped with parmesan garlic or fire-grilled. For a tasty twist, order the Bacon Planked Oysters, which feature strips of bacon topped with fried oysters and a remoulade and sweet-pepper sauce.